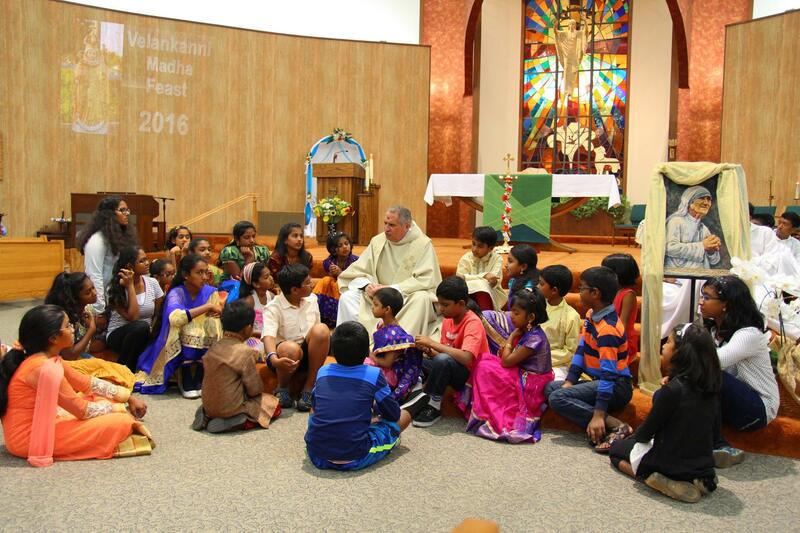 Angels from heaven cheering, Holy Mary’s devotees praying and singing, and Reverent Fathers blessing, we all experienced a spiritually benefiting and culturally impressive celebration of Our Lady of Velankanni’s feast at the “Church of Resurrection” from August 26 through September 03, 2016. 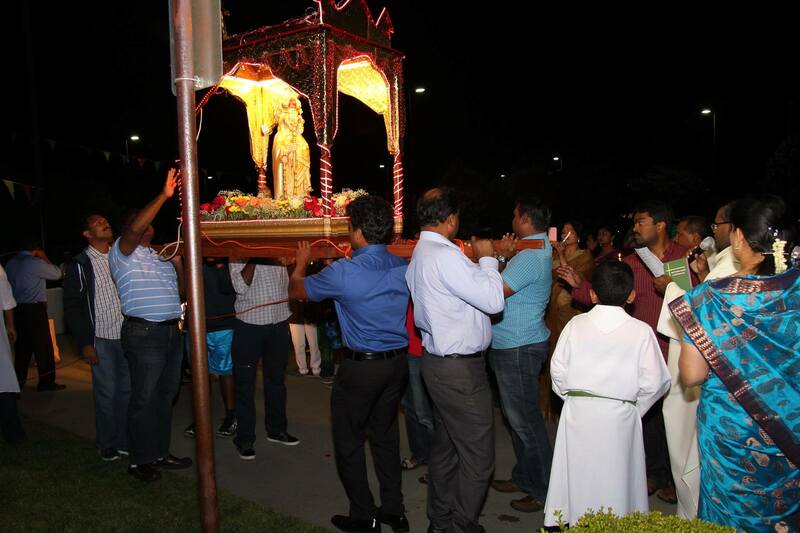 The celebration of the feast was great experience spiritually benefiting us and glorifying the Mother of our Savior, and also attracted many devotees from multiple ethnic communities from different places who filled-up the "Church of Resurrection" on the final feast day, Saturday, September 03, 2016. Many who participated in this celebration felt spiritually touched, impressed, and appreciated all the hard-work in making this feast very successful! With the blessings from Vicar General Rev. Msgr. Francis V, Cilia, Rev. Fr. Noel Sanvicente, Rev. Fr. Louis Leveil, and Rev. Fr. Kennedy, the support from the parish of the Church of Resurrection and Diocese of San Jose, the dedication, hard-work and support from the volunteers and organizers, and help of the generous contributors, the celebration was grandiose. 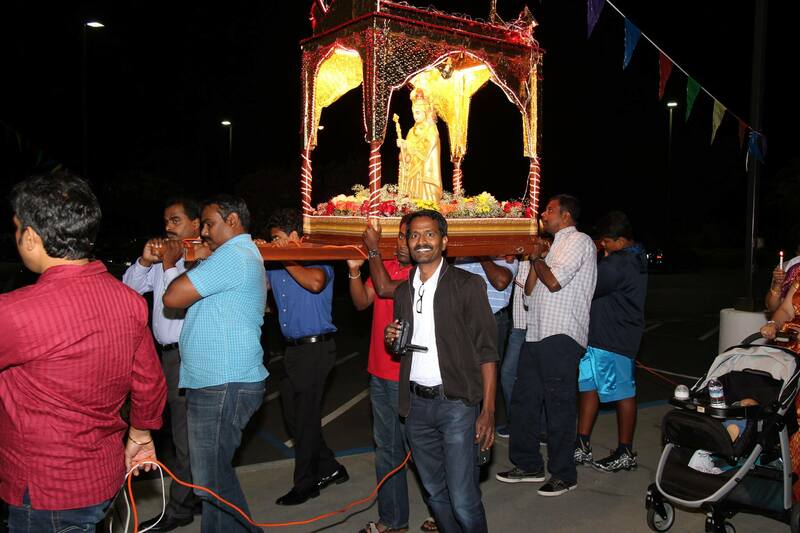 The organizers and volunteers of the feast, whole heartedly THANK all those who came to celebrate the feast of Our Lady of Velankanni, the Queen of all Saints, with us. 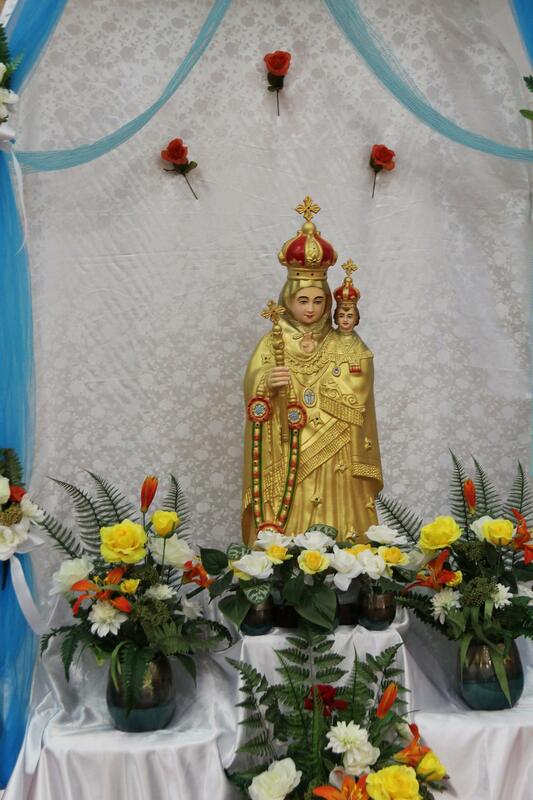 We humbly and cordially invite all again to come and honor our beautiful Lady of Health with baby Jesus in her hands (Arokia Madha), the Mother of God, during coming years! We thank Vicar General Rev. Msgr. 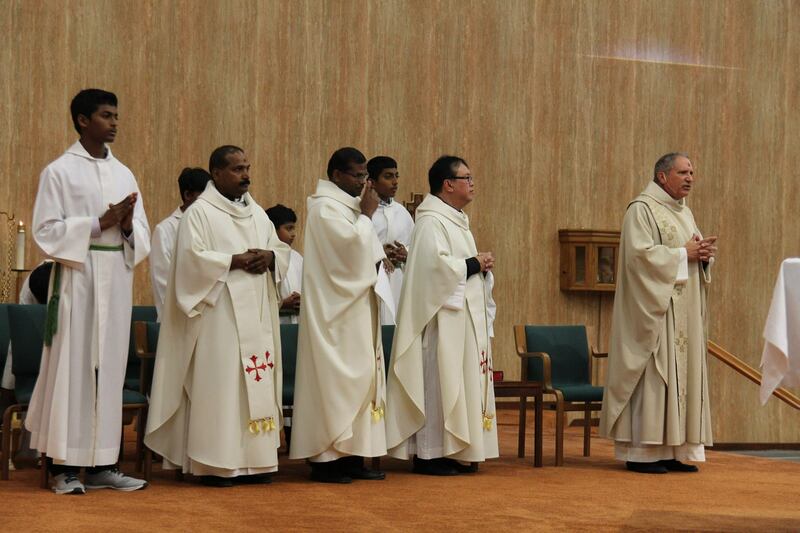 Francis V, Cilia, for his blessings and being with us in celebrating the feast Mass for us, and we are very grateful that Vicar General has been celebrating this feast since the beginning all 3 years. We are thankful to the new pastor, Rev. Fr. 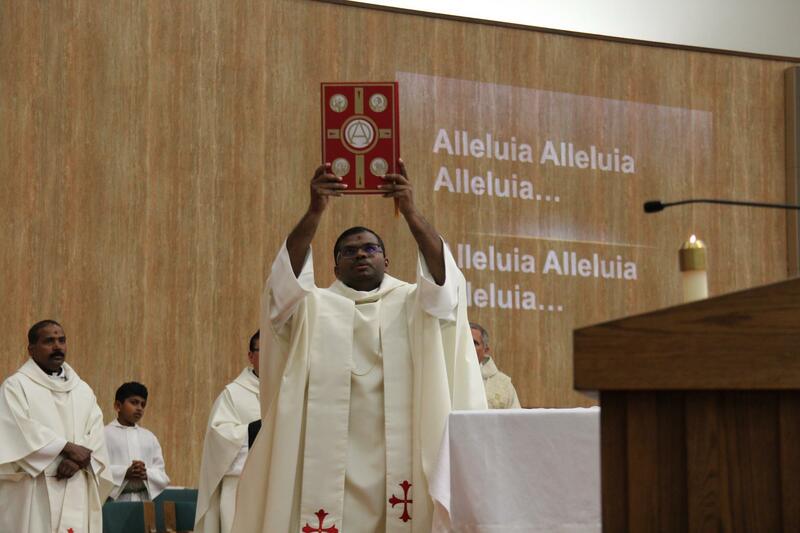 Noel Sanvicente, of "Church of Resurrection" for his blessings and celebrating with us in this feast, which include flag-hoisting, and celebrating the feast Mass. We thank Fr. Louis Leveil for his blessings and celebrating the feast with us, and we are very thankful that Fr. Louis readily available to meet our community needs and offer spiritual guidance. We thank Fr. Kennedy for his blessings and being with us in celebrating the feast, and his active participation in the pre-feast activities such as patti mandram. We also want to thank the "Church of the Resurrection" parish and Diocese of San Jose for all the support and giving us the church facilities for us to use for the purpose of spiritual and cultural activiies. - Organizing and working-out all the fine detail for the whole celebration. - Marvelous artwork in decorating statue carrier and stage at the Altar for Our Lady of Velankanni statue, stage decoration at Farana Center, and decorating the flag-hoisting place which include beautiful rangoli. - Excellent choir performance with divine songs and melodious musical and projecting songs and prayers on the slide so all in the church can follow and participate. 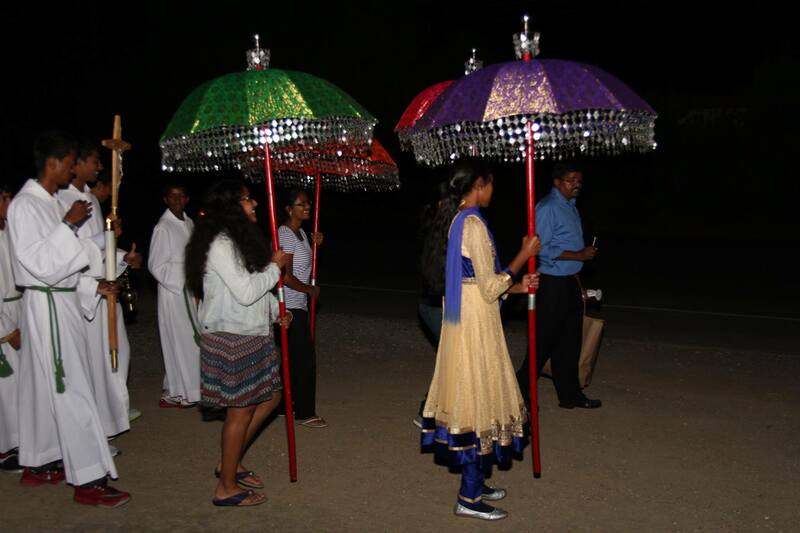 - Meticulously taking care of all fine detail of procession needs. - Setting-up tables and chairs for the fellowship & dinner. - Transferring decorative / kitchen materials between church / farana center and the storage. - Cleanup after every event. 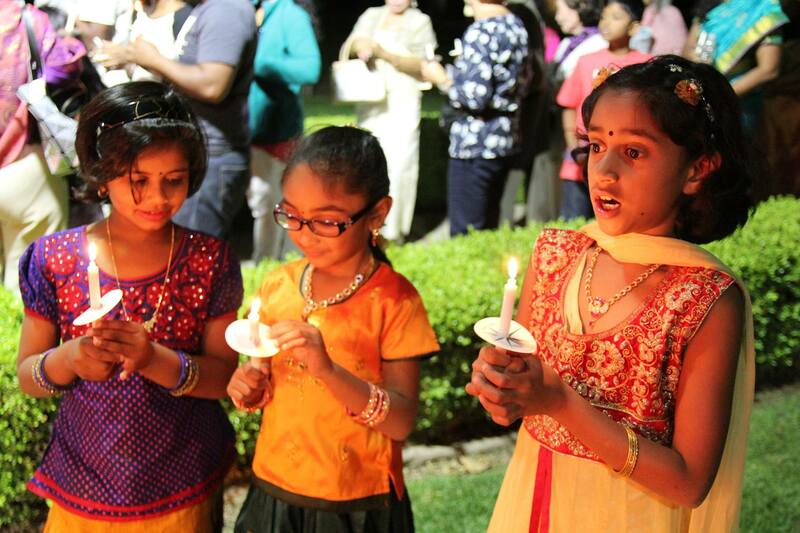 We want to thank and recognize the families of Jesu Augustine, Pauline & Sanjay, and Rani & Benjamin, for generously sponsoring the dinner on the feast-day. We also want to thank other generous donors who contributed various things to help with the celebration, and this include: generous donations, decoration materials, gifts/shawls for priests, flowers, generator, etc. 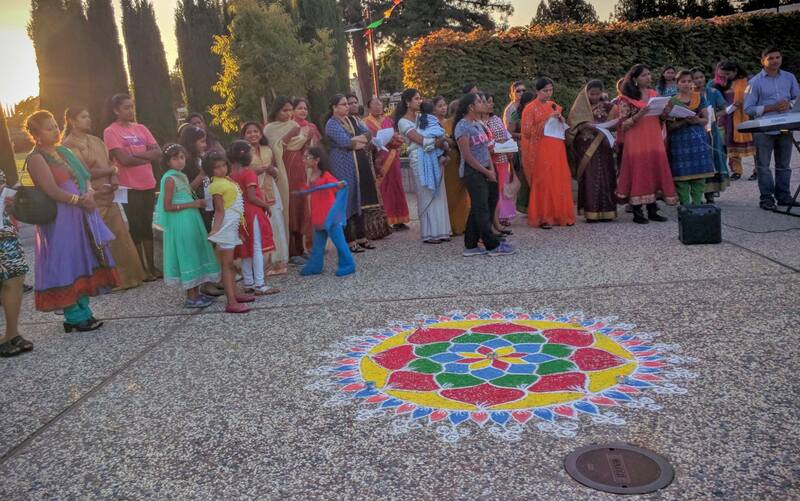 First Day of Celebration – Novena & Flag hoisting (August 26, 2016): As a preparation for the celebration, the volunteers erected flagpole near the Church of Resurrection (same place as last year) and decorated the nearby places with flowers and rangoli, etc. 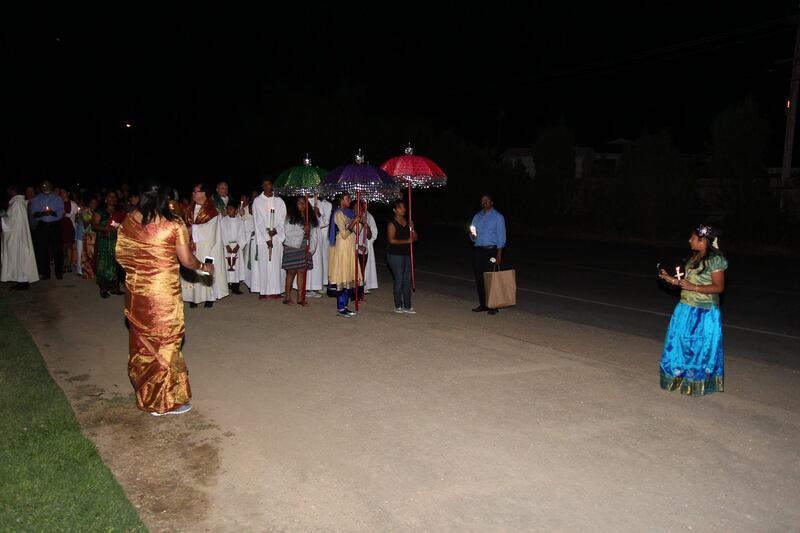 The first day ceremony started by saying first novena prayer to Our Lady of Velankanni, and followed with Fr, Noel Sanvicente, the pastor of the "Church of Resurrection", hoisting the flag of Our Lady of Velankanni. Rev. Fr. Louis Leveil and Rev. Fr. Kennedy honored this celebration by their presence, and Fr. Louis Leveil gave welcome and thank-you speech. Even-though it was a working day (Friday), this event was very well participated including devotees coming from distant places. This first day of celebration was concluded with fellowship and delicious potluck dinner at Farana Center Hall of "Church of the Resurrection", Sunnyvale. Novena (August 27, 2016 through September 02, 2016): Devotees gathered in Farana Center Hall of the Church of the Resurrection to say second day novena prayer on August 27, 2016. Teleconferencing was used to say novena prayer remotely from third day (August 28, 2016) through eighth day (September 2, 2016). As these were working days, teleconferencing helped many to participate in this spiritual activity easily from wherever they are. 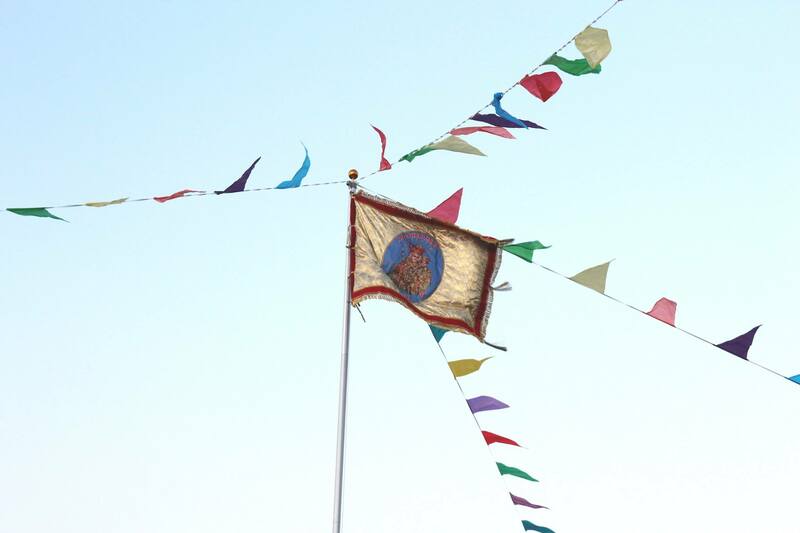 Pre-Feast day – Novena & Fun Activities (September 02, 2016): Before celebration started, the volunteers decorated the performance stage at Farana Center, and arranged chairs, tables and audio system for the event. Three groups of kids danced awesome for the religious songs, and one of them was Bharatanatyam. 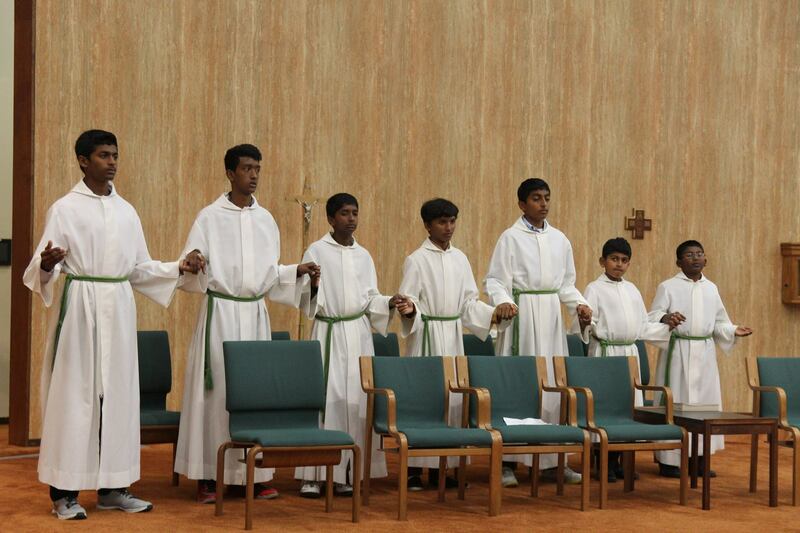 One group of kids also performed a skit narrating Our Lady of Velankanni’s miracles. Then, we had fund-raising dinner that followed with patti mandram and the topic was குடும்பத்தில் அமைதியை நிலைநாட்டுவது -ஆண்களா/பெண்களா (who brings tranquility to the family – is it men or women?). 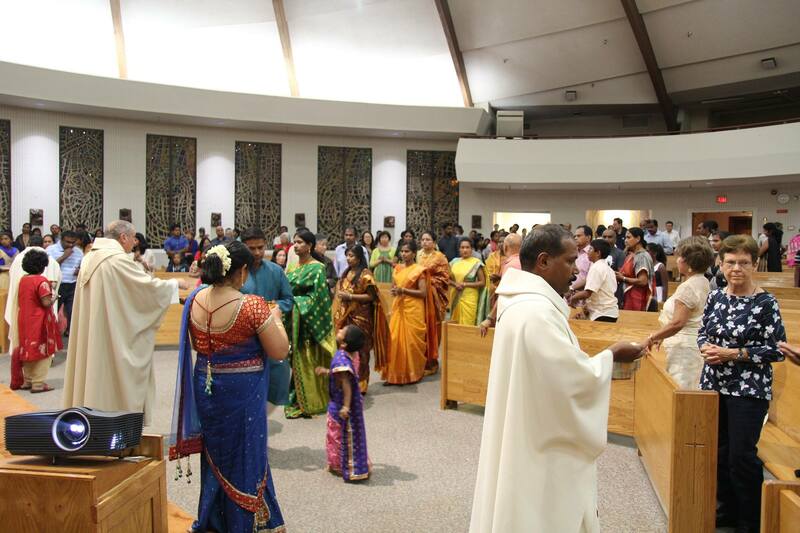 Once again, thank you all for celebrating Velankanni Matha feast, and being part of us in this celebration!